Brooms have been used for centuries to sweep up, in, and around the home and workplace. They may be made from a variety of materials, both man-made and natural. Man-made bristles are generally of extruded plastic and metal handles. Natural-material brooms may be constructed of a variety of materials, including brush, but generally include stiff grasses such as broomcorn and/or sotol fiber. Broomcom brooms have been made for at least 200 years and are considered superior brooms. Plastic brooms merely move dirt around, however, broomcom stalks actually absorb dirt and dust, wear extremely well, and are moisture-resistant. Broomcom brooms are the most expensive of the manufactured brooms. Broomcom is actually a variety of upright grass of the species sorghum referred to as Sorghum vulgare, or S. bicolor variety technicum, belonging to the family Gramineae and cultivated for its stiff stems. Broom bristles are derived when these stiff, tasseled branches—that bear seeds on the ends—are harvested and dried. The seeds are edible, starchy, and high in carbohydrates. They can be used for human consumption (in cereals) or for animal feed. The tasseled stalks, used in the manufacture of brooms, can grow 2-8 ft (0.61-2.4 m) tall. Sorghum is especially valued in hot and arid climates due to its resistance to drought. Mexico grows and processes most of the broomcom and sotol fiber used in American broom production. Sotol fiber, a yucca fiber, is sometimes used on the inside of the broom and is wrapped with more expensive broomcom, thus lowering the price of the natural-bristle broom. The production of broomcom brooms is still largely a craft production with a single operator working quickly at a machine, making brooms by hand. There have been some changes in the manufacture of broomcom brooms within the last several decades, but those changes have been very minor. Essentially, the handcraft has changed little since mid-twentieth century. Brooms were often used in matrimony rituals to symbolize a union.. Enslaved African-Americans married one another in a civil ceremony referred to as "jumping the broom" in which the couple would literally jump over a broom to signify matrimony. Today, African-Americans occasionally recreate this custom by jumping over a broom at weddings, using specially handmade and decorated brooms for this purpose. These brooms then become a centerpiece within the new household. with attaching the circular bundles of broomcom led to wooden handles. By about 1810, wooden handles with holes drilled into them were used to lash the broomcom to the handle using wooden pegs. Whether Levi Dickenson was the first American to use sorghum to make brooms is in contention. However, nearly all acknowledge that the United Society of Believers, familiarly called the Shakers, quickly moved into the broom-making business about 1798 by growing broomcom and making brooms. The Shakers' Watervliet, New York, community took the lead in manufacturing brooms, although nearly all the Shaker communities constructed and sold them throughout the century. The Shakers are credited with inventing the flat broom. They recorded that Theodore Bates of Watervliet examined the circular bundled broom and determined that flat brooms would move dust and dirt more efficiently. The bundles were put into a vice, flattened, and sewn in place. The Shakers led the way in improving the broomcom broom. They appear to be the first to find that wire more effectively secured the broomcom to the wooden handle rather than tying or weaving. They developed treadle machinery to wind broomcorn around the handle while securing it tightly. They developed special vices to flatten the broom for sewing into the requisite flat shape. Still other machinery was devised to quickly separate the seeds of the broomcom from the tassel bristles. Using foot-powered machinery, the Shakers could make two dozen brooms per person per day—quite a feat for the early nineteenth century. Today, the machinery is electrically powered. However, in even the largest American broom factory, the production of broomcom brooms is still remarkably a hand craft. (One factory foreman in a large broomcom factory says he can pick up a broom and tell who amongst his staff made it because each one is made according to the skills and preferences of the maker.) A single machine and operator sits at a machine and constructs a broom. The machines, and the methods, have not changed in over 40 years. The most significant development in the history of the product resulted from the North American Free Trade Agreement (NAFTA) in 1994 when tariffs were lifted from broom-corn brooms imported from Mexico. Cheaper than American brooms (labor is cheaper and broomcorn is grown there in huge quantities), the Mexican-made broom importation obliterated many American broomcom manufacturers. American broomcom manufacturers pressed for more restrictive tariffs, but such tariffs were overruled. Today, there are only about 15 broomcorn manufacturers left in the United States. The material used is broomcom, which is shipped bundled in large bales. The bundles are grouped according to the length of the grass and color. Sotol fiber from the yucca plant may be used in cheaper broom-corn brooms. White metal wire, of approximately 18 gauge, is used to secure the broomcom and sotol to the handle. A small nail or two is used to secure the wire to the handle. The handles are generally of wood. Sometimes American hardwood is used, but more likely the wood used is ramin wood, an imported wood of dense, heavy, coarse grain. Thick twine is used to sew the brooms flat using a sewing machine. Finally, water is necessary in that the broomcom must be wetted completely in order to be worked. It is important to note that brooms made from broomcorn are made at a station, using a single piece of machinery. Using this machine, brooms are largely still assembled by hand. The process described below is used by the largest manufacturer of brooms and the factory uses about 28 makers to produce 6,000 brooms per day. The raw material for the broom, the broomcorn, comes into the factory already processed and bundled. The bundles are sorted by length and are sorted by the color of the fiber. Bundles are grouped together in a bale weighing about 120 lb (54 kg). Broomcom must be wet in order to be worked effectively and must be quickly dunked in water before being delivered to the operator. Each bale is lifted with a crane and submerged in a tank of water for 10 seconds. The bundles are then removed from the water using the crane. Workers break apart the wet bales and separate the smaller bundles within the bales. The bundles are placed on racks and rolled to operators who sit at broom-manufacturing equipment. An operator sits at a broom-making machine and has the broomcom and solid handles there to work. An individual handle is picked up by the operator. The operator inserts a metal wire into a hole drilled near the bottom of the handle. Then, the insides are first applied to the broom. In this process, the lowest-grade grass is pressed around the wooden handle, forming the center of the broom. This thick bundle of grass is secured tightly to the handle using the wire attached to the handle through the hole. Then, the shoulders and sides of the broom are given shape as smaller bundles of lesser grade grasses are placed along each side of the center bundle of grass. This side corn is secured to the central bundle of grass using more tinned wire that is wrapped by hand tightly around the side corn as well as the central body of grass. Next, the grass is cut off in a straight line just above the wire by the operator using a knife. Over this foundation of lower-grade dbroomcom or other grasses is now added the outside of the broom, or the broomcom we see when we look at a broom. The hurl, the best grade of broomcom used in a broom, is attached to the broom. It is laid atop the center section and shoulders, completely covering it. The hurl is physically attached to the broom using the same piece of white metal wire used earlier in the process. The final construction step is referred to as the run down. The operator runs the wire that secures the hurl down to the handle and nails it off, thus securing the cut end to the wooden handle. The grasses and broom-corn are now completely secured to the broom. The brooms are now constructed but are not finished yet. In order to complete the broom, the broomcom must be dried out completely. The brooms are moved by rack or palette into a very large drying room that is thermostatically controlled. Depending on the weather, the brooms are left in this large, hot room for five to six hours. When instruments inside the room indicate that no more moisture is being released from the brooms, the heat kicks off and the broomcom has completely dried. The brooms are now seeded, meaning that cylinders roll vertically over the broomcom, thus removing all the seeds and small pieces of broomcorn not secured to the handle that will fall out quickly upon use. The seeded brooms are taken to sewing machine operators who run the brooms through a heavy-duty sewing machine with two needles that is threaded with thick twine. The brooms are put through the machine and the broom is flattened and its shape is maintained through the double, triple, or quadruple rows of sewing (depending on the machine and company) that holds the grasses tightly. It takes about 45 seconds to sew the brooms into a flat shape. The brooms are moved by cart to final finishing, where they are trimmed across the bottom so they are even, packaged, and sent for distribution. Broomcom is carefully graded so that the manufacturer understands the quality of the product that is shipped in the bale. Broomcorn is categorized by length and by color, with the brown-red broomcorn considered inferior. Inferior broomcom may be used on the inside of the broom close to the handle and the operator ensures that the inferior product remains out of sight. Machinery must be in good shape as well. Each individual broom-making machine is maintained, and the craftsman at each machine knows instantly when the machine is amiss. Other machinery such as the hydrostatic dryers or the seed removers are carefully monitored to ensure they perform efficiently. However, it is the broom makers themselves who are the key to monitoring quality of broomcorn brooms. Because the manufacture is completed using one operator per station who works from beginning to end on the product, he or she is sees and handles the product for nearly the entire process (except the sewing process). Each operator can tell whether the product has gone awry and can set aside such a broom so that it will not make it to a retail outlet. 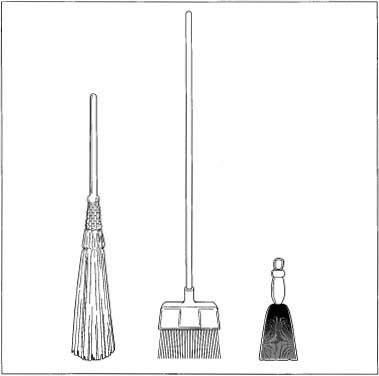 The broom model has changed little over the past 200 years. Today, there are brooms with synthetic fibers that attract dirt and dust. There are also brooms made of finer, polypropylene fibers with angled bristles. Smaller whisk brooms are also available as are brooms with easy to grip rubber handles. The Internet has brought broomcorn brooms to every home with easy ordering and delivery. Andrews, Edward Deming. The Community Industry of the Shakers. Albany, NY: The University of the State of New York, 1993. Nylander, Jane. Our Own Snug Fireside. New Haven: Yale University Press, 1994. Broom Shop. http://www.broomshop.com (January 2001). Organization of American States Website: NAFTA Dispute Settlement: Broomcorn Brooms. http:www.sie.oas.org (January 2001). R.E. Caddy & Company, Inc. http://www.recaddy.com (January 2001).